A blunder from Leicester keeper Conrad Logan helped West Brom come out on top in their fourth round Carling Cup tie. Simon Cox dinked over Logan to put the Baggies ahead before the Foxes levelled when Nicky Shorey turned a Paul Gallagher cross into his own net. But Logan fluffed a hopeful ball forward from the visitors and left Somen Tchyoi a simple finish to score. Steven Reid added to the West Brom lead with a header and a long range Cox strike secured their victory. West Brom are sixth in the Premier League after a win over Fulham last Saturday and manager Roberto Di Matteo chose to give the team that earned that win a rest as he made 11 changes. Leicester counterpart Sven-Goran Eriksson made eight changes and, although his side made the better start, the Foxes soon found themselves behind. Giles Barnes sent a Baggies cross to the far post where Tchoyi passed to Roman Bednar and his effort found its way to Cox, who produced a lovely finish to dink the ball over on-rushing keeper Logan with aplomb. The goal opened the game up and, while the pace of Lloyd Dyer provided a threat for Leicester, it was the visitors who started to take a stranglehold of the match. Midfielder Graham Dorrans was looking an assured figure for Di Matteo's men and he produced a delightful ball to find an unmarked Bednar, whose header was tipped over by Logan. However, Leicester were back on level terms when a Gallagher ball across the face of the Baggies goal was put into his own net by substitute Shorey. The home side were level for only nine minutes before a West Brom ball inexplicably spooned off Logan's gloves and fell for Tchoyi, who was recently gifted a goal against Manchester United after keeper Edwin van der Sar spilled a cross and was again the beneficiary of a mistake as he scored to put the Baggies ahead again. Reid had been an influential figure for the Premier League side and he got the goal his performance deserved when he headed in a corner at the far post. And Cox showed his finishing prowess when he powered in a long range strike, which might have taken a deflection off Yuki Abe, to put the Di Matteo's men into the quarter-finals. "Of course it's a mistake [by Logan], everyone knows that and he knows that. "That happens in football, but the third or fourth goals were worse. "You know goalkeepers sometimes make mistakes, it was unlucky. "You can imagine how you feel when it's an important game, it's 1-1 when we are in the game and we have a good chance to win it. "It happens in football, but he will not sleep very well tonight." "We're just as aghast as well, we don't know what's going on, but if that keeps happening for him [Tchoyi] he might be starting week in, week out. "I'm very pleased, it's a fantastic result. I'm very pleased with the performance in both aspects of defending and attacking." 90:00+3:57 The final whistle is blown by the referee. 90:00+2:45 Foul by Yuki Abe on Graham Dorrans, free kick awarded. Nicky Shorey takes the direct free kick. 90:00+1:26 Steve Howard fouled by Gianni Zuiverloon, the ref awards a free kick. Shot comes in from Paul Gallagher from the free kick. 90:00+1:02 Ishmael Miller takes a shot. Conrad Logan makes a save. 89:14 GOAL - Simon Cox:Leicester 1 - 4 West Brom Simon Cox grabs a goal from long range to the top right corner of the goal. Leicester 1-4 West Brom. 88:32 Corner taken by Paul Gallagher. 84:02 Substitution (West Brom) makes a substitution, with Ishmael Miller coming on for Roman Bednar. 83:05 Matt Fryatt has an effort at goal from 30 yards. Save by Boaz Myhill. 80:50 Giles Barnes takes a shot from 12 yards. Save by Conrad Logan. 78:54 Outswinging corner taken by Giles Barnes from the right by-line, Giles Barnes provided the assist for the goal. 78:54 Substitution (West Brom) makes a substitution, with Sam Mantom coming on for Abdoulaye Meite. 78:54 GOAL - Steven Reid:Leicester 1 - 3 West Brom Steven Reid scores a headed goal from deep inside the penalty area. Leicester 1-3 West Brom. 76:34 Angelo Miguel Vitor concedes a free kick for a foul on Giles Barnes. Nicky Shorey produces a shot on goal direct from the free kick, Conrad Logan makes a save. 76:34 Booking Angelo Miguel Vitor goes into the book for unsporting behaviour. 72:43 Shot by Paul Gallagher from outside the box goes over the net. 71:04 Paul Gallagher takes the inswinging corner, clearance by Nicky Shorey. 70:23 Foul by Steven Reid on Steve Howard, free kick awarded. Paul Gallagher crosses the ball in from the free kick, save made by Boaz Myhill. 69:48 Substitution Michael Lamey on for Robbie Neilson. 66:17 Substitution Matt Fryatt on for Andy King. 61:51 Assist by Abdoulaye Meite. 61:51 GOAL - Somen Tchoyi:Leicester 1 - 2 West Brom A goal is scored by Somen Tchoyi from inside the penalty box high into the middle of the goal. Leicester 1-2 West Brom. Correction - 60:19 Yuki Abe has an effort at goal from outside the area which misses left. 60:19 Yuki Abe has an effort at goal from outside the area which goes wide left of the target. 58:40 The ball is swung over by Giles Barnes, Header from deep inside the area by Roman Bednar goes over the bar. 56:42 Steve Howard gives away a free kick for an unfair challenge on Ibanez Pablo. Free kick taken by Nicky Shorey. 56:42 Booking The referee cautions Steve Howard for unsporting behaviour. 52:36 Paul Gallagher sends in a cross, assist by Paul Gallagher. 52:36 Substitution Richie Wellens on for Lloyd Dyer. 52:36 GOAL - Nicky Shorey:Leicester 1 - 1 West Brom An own goal is conceded by Nicky Shorey. Leicester 1-1 West Brom. 52:06 Outswinging corner taken from the left by-line by Paul Gallagher. 50:30 Free kick awarded for an unfair challenge on Ibanez Pablo by Robbie Neilson. Boaz Myhill takes the direct free kick. 49:10 Outswinging corner taken by Paul Gallagher, Somen Tchoyi manages to make a clearance. 48:38 Corner taken right-footed by Paul Gallagher, clearance by Roman Bednar. 45:34 Paul Gallagher fouled by Simon Cox, the ref awards a free kick. Conrad Logan takes the direct free kick. 45:01 Substitution Nicky Shorey comes on in place of Marek Cech. 45:00+1:04 The referee calls an end to the first half. Correction - 45:00+0:30 Ibanez Pablo fouled by Andy King, the ref awards a free kick. Boaz Myhill restarts play with the free kick. 45:00+0:30 Andy King concedes a free kick for a foul on Ibanez Pablo. Direct free kick taken by Boaz Myhill. 43:22 Centre by Giles Barnes, Angelo Miguel Vitor manages to make a clearance. 38:11 Roman Bednar takes a shot. Save by Conrad Logan. Outswinging corner taken by Giles Barnes from the right by-line, clearance made by Robbie Neilson. Roman Bednar fouled by Yuki Abe, the ref awards a free kick. Free kick crossed right-footed by Roman Bednar from right channel, clearance made by Steve Howard. 36:43 Effort from the edge of the area by Somen Tchoyi goes wide of the right-hand upright. 35:59 Foul by Somen Tchoyi on Yuki Abe, free kick awarded. Franck Moussa restarts play with the free kick. 33:35 Inswinging corner taken from the left by-line by Giles Barnes, Ibanez Pablo concedes a free kick for a foul on Bruno Berner. Conrad Logan restarts play with the free kick. 31:36 Abdoulaye Meite concedes a free kick for a foul on Franck Moussa. Paul Gallagher shoots direct from the free kick. 31:36 Booking Abdoulaye Meite is cautioned by the ref for unsporting behaviour. 27:45 Giles Barnes takes a shot. Save by Conrad Logan. 26:15 Simon Cox challenges Steve Howard unfairly and gives away a free kick. Free kick crossed left-footed by Paul Gallagher, Boaz Myhill makes a save. 23:32 Steve Howard takes a shot. Save by Boaz Myhill. 22:26 Shot by Simon Cox from 25 yards. Save made by Conrad Logan. 20:40 Assist on the goal came from Graham Dorrans. 20:40 GOAL - Simon Cox:Leicester 0 - 1 West Brom Simon Cox finds the net with a goal from just inside the area high into the middle of the goal. 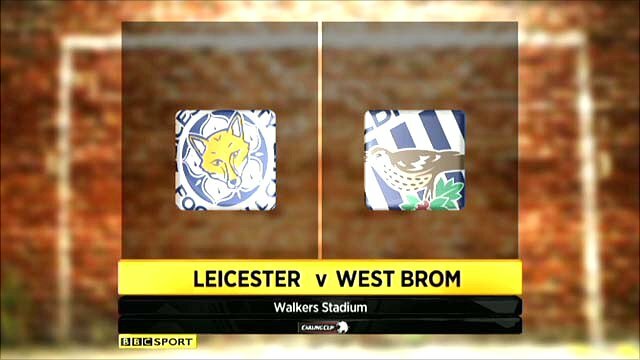 Leicester 0-1 West Brom. 19:00 The ball is crossed by Paul Gallagher, clearance made by Marek Cech. 16:58 The ball is crossed by Gianni Zuiverloon, clearance made by Robbie Neilson. 15:43 Lloyd Dyer takes a shot. Save by Boaz Myhill. 14:23 Unfair challenge on Ibanez Pablo by Steve Howard results in a free kick. Boaz Myhill takes the free kick. 13:54 Outswinging corner taken from the right by-line by Paul Gallagher. 12:55 Shot from long distance by Paul Gallagher goes wide of the left-hand post. 8:22 Steven Reid fouled by Lloyd Dyer, the ref awards a free kick. Steven Reid takes the direct free kick. 6:57 The referee blows for offside. Conrad Logan restarts play with the free kick. 6:09 Andy King is flagged offside by the assistant referee. Boaz Myhill restarts play with the free kick. 4:44 Short corner worked by Lloyd Dyer. 1:10 Abdoulaye Meite gives away a free kick for an unfair challenge on Steve Howard. Free kick taken by Franck Moussa.